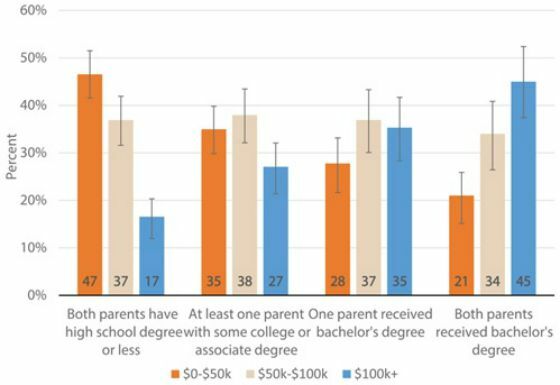 Do College-Educated Parents Have Higher Earning Kids?Do College-Educated Parents Have Higher Earning Kids? Do College-Educated Parents Have Higher Earning Kids? 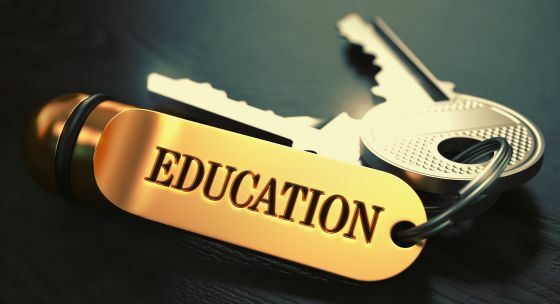 There is overwhelming evidence that the higher the educational attainment one has the more one will earn in his or her lifetime. Is there a correlation between the educational attainment of the parents and their kids? Recent Interesting research carried out by the Federal Reserve shows this is clearly the case and quantifies this as the following chart shows. It’s clear that the more educated the parents are the more the children are as well and vice versa. It shows how beneficial it can be to be raised in an educated household. Bill Gates often talks about how lucky he was to be born to parents who were professional, well educated, and indulged him when he would pepper them with questions versus not engaging with him which could have easily happened to him in a household with parents who were less educated, not as curious, disinterested, or too busy. He does not think he would have been as successful had they not indulged his inquisitiveness and made it safe for him to seek and question. There is a significant increase in $100,000+ incomes per year households when parents go from a high school education or less to both having bachelor’s degrees. The percentages jump from 17% to 45%. The most important reasons for children of lower educated parents not attending college were cost (41%) and family responsibilities (40%). The major barrier for kids of better-educated parents was a lack of interest (38%). Unless they intend to use their time more productively, rich parents need to get their kids back in the game! Despite the differences, each segment feels like they’re doing better than their parents were at the same age and will continue to do so as the next two charts show. “Overall, 51 percent of all individuals aged 25-44 report that they are better off than their parents, while only 24 percent indicate that they are worse off. 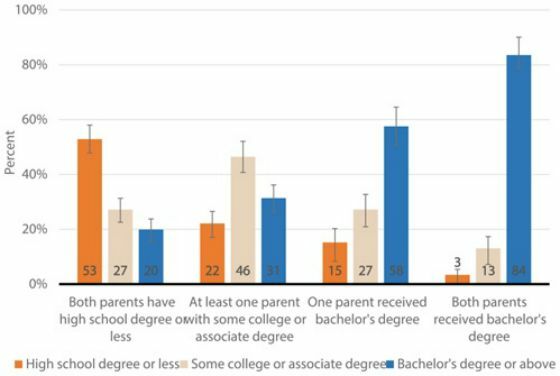 Additionally, the frequency with which respondents feel that they are better off than their parents is largely consistent across socioeconomic starting points, with the exception of individuals for whom both parents completed their bachelor’s degree. Among those young adults with two parents who obtained a bachelor’s degree, only 40 percent believe that they are doing somewhat or much better off than their parents at the same age. 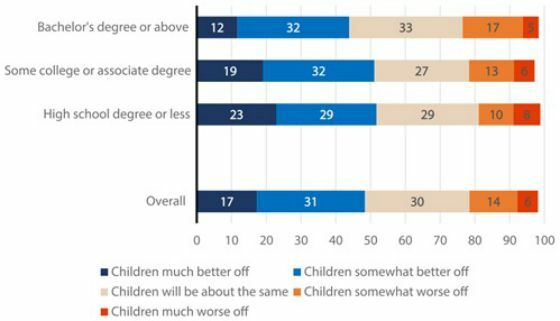 This is a significantly lower fraction feeling that they are better off than is observed among those for whom neither parent had a college education (54 percent). 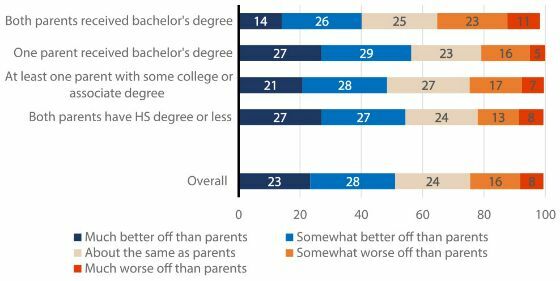 Although there is a lot of talk about inequality, it’s nice to see that people whose parents have less educational attainment feel like they will do better than them in the future. Although they may not catch up to those who had a head start coming from well-educated parents, it is encouraging that the belief in social mobility is definitely there. Do you agree with the research that well-educated parents have higher earning kids? You have read the research. Do you agree that well-educated parents provide opportunities for their children that enhance their earning potential? Please let me know in the comments below.